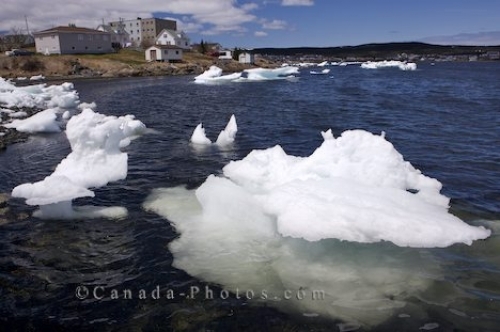 The pack ice floating around the harbour of St. Anthony, Newfoundland, melting a little more each day during the summer. As summer arrives in Newfoundland, Canada, the pack ice floating in the harbour of St. Anthony shrinks daily as the warmer temperatures melt the ice chunks. Once the pack ice has disappeared from the surface of the harbour, boats must be leery of any large masses that many hover beneath the surface which have not completely thawed. Pack Ice in the St Anthony Harbour, St Anthony, Northern Peninsula, Viking Trail, Newfoundland, Canada. Picture of the pack ice floating in the harbour of St. Anthony on the Northern Peninsula of Newfoundland, Canada.